Awhile back, I wrote an introductory post about a program I recently went through called Dressing Your TruthTM. (You can find that post here if you missed it before.) I mentioned that I would give some more details about my own personal experience with this program, so today I’d like to tell you a little bit more about what it was like for me. As I mentioned last time, after completing the free course, I decided that I had a primary TYPE 2SM energy with a secondary TYPE 4SM energy. The TYPE 1SM bright, animated woman. The TYPE 2SM soft, subtle woman. The TYPE 3SM rich, dynamic woman. The TYPE 4SM bold, striking woman. 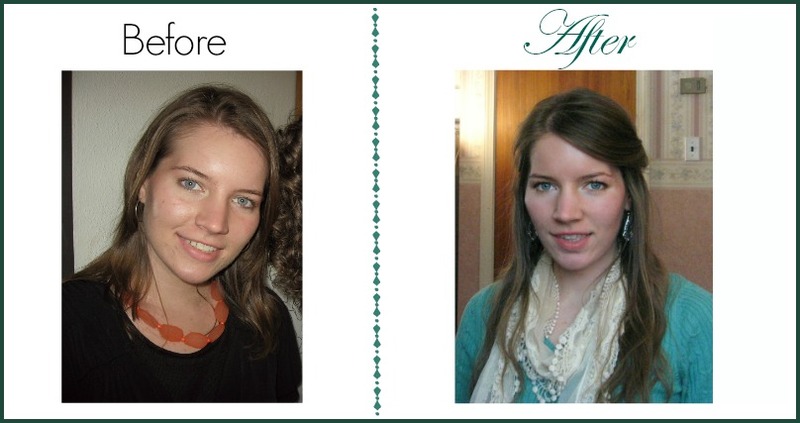 I wanted to start by showing you a before and after. Unlike some of the other Dressing Your Truth transformations that you can see, mine isn’t really very dramatic. True to my TYPE 2 nature, it’s a much more subtle change. In fact, I don’t even have a real “before” picture to show you. I searched through all my pictures, and this is the best example I could find. It’s actually a picture from a few years ago back when I was in college. I was looking back through all of my pictures, trying to find a more recent one that was an example of clothing that did not match my Type of Beauty, but I couldn’t find a good one. I realized that I had been unconsciously dressing more and more like a TYPE 2 woman over the past few years, and that, for times when I knew that my picture would be taken, I tended to choose the items of clothing that I liked the best, which were actually clothes that were already perfect for my TYPE 2 nature. I was wearing a black dress in the picture on the left, and it was one that I wore mainly because I thought it was supposed to be a fashionable color and not because I really liked it. It’s a little harder to tell in this picture because I was so tan from the summer sun, but whenever I wear black, it seems to make my face look really pale and washed out too. The necklace I’m wearing is one I never really liked either. I had bought it online, and I had liked the way it looked in the catalogue, but when I tried it on, it just didn’t feel right to me. It was too big and heavy, and it didn’t feel comfortable at all. I actually never wore it again after that one day. The softer colors, the silver teardrop earrings, and the details on the lace scarf are all things that I really love, and I feel much more “me” when I’m wearing an outfit like this than I ever did when I was wearing outfits like my “before” photo. I realize now that the sort of clothing pieces and accessories that are the best for a TYPE 2 woman are the ones that I’ve always loved the most even from the time that I was very little. When I was younger, I always loved playing dress-up and putting on long-flowing princess gowns (aka dresses I found at yard sales), and I remember wishing that my ears were pierced so that I could wear tear drop dangle earrings. Even when I was very young, I was looking for the flowing, downward movement of a TYPE 2 energy to be reflected in the clothing I wore. Over the years, I’ve bought many items of clothing with colors that were very bright, with bold, contrasting patterns, but the real reason I bought them was because they seemed like they were supposed to be in style and not because I truly liked them. And because shopping for clothing can be pretty frustrating sometimes, there were many times when I bought things just because they fit or they were on sale, or because I needed a certain item of clothing and I was too tired to keep trying at other stores so I just bought something that was close to what I needed but wasn’t really what I loved. When I was cleaning out my closet recently, I found quite a few items of clothing that I had only worn a couple of times because whenever I put them on, they just didn’t feel right. There were times when a shirt or a skirt looked great on the hanger, but then when I put it on it just felt like I was playing dress-up again but that this time I was trying to be someone that I really wasn’t. Now that I’ve gone through my closet, I’ve taken out all of the clothes that I hardly ever wore and all of the clothes that weren’t appropriate for my TYPE 2 nature and donated them. 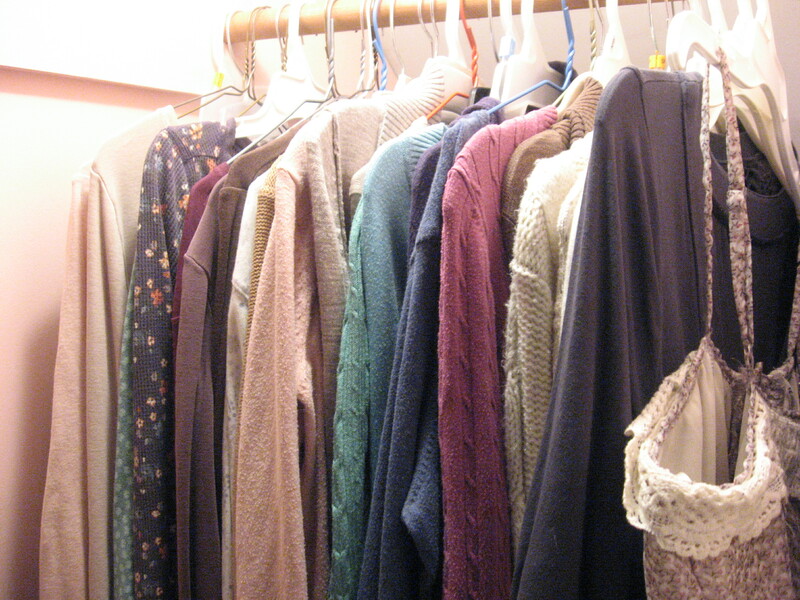 When I look in my closet now, all that is left is clothing that I really like, in soft, pretty colors that I love, and it’s so much easier deciding what to wear now because I don’t have to wade through all of the clothing that wasn’t right for me. Shopping is So Much Easier! I’m also loving how easy and how fun shopping has been lately. When I walk into a store, my eyes are immediately drawn now to the colors that are in my TYPE 2 color palette, and that gives me a starting point for where to look. Once I find items in the colors that are right for me, I can look at the design lines and patterns, and feel if it seems comfortable and if it’s something that I like. Having a color palette as a guideline narrows down the items in the store so that there isn’t an overwhelming array of choices, and it’s easier for me to decide which ones I really like enough to spend money on. It’s also been fun to try some new colors and styles that I might not have given a chance otherwise. I used to gravitate toward brighter colors because some of the more pale, muted colors seemed a bit washed out in comparison, but I’ve been trying more muted colors lately, and I’m really liking them! Just recently I bought a pale blue shirt that I probably would have walked right by before because I thought it was a “nothing” color that would just be invisible, but now I love the color, and it’s one of my favorite shirts. 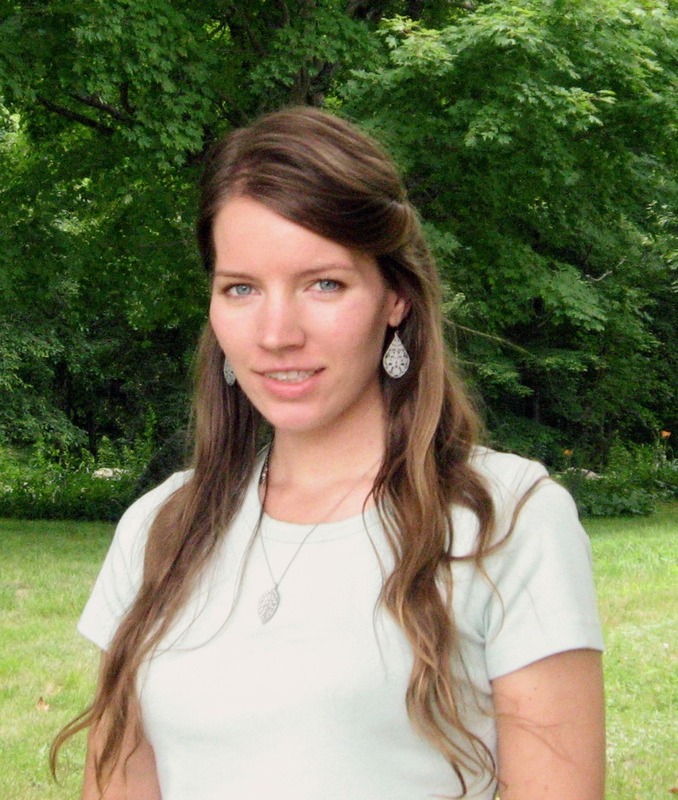 Here’s a photo of me wearing the shirt (and one of my favorite pairs of earrings, too). The shirt looks slightly more blue in real life than it does in this photo. It’s really hard to find the right lighting so that you can see what the colors really look like. If you’ve already taken the free course and discovered your Type of Beauty, I’d love to hear more about how the experience has been for you! Feel free to share with us in the comments below. You can also see more pictures of clothing and accessories that I love on my Dressing Your Truth Pinterest board here. I’m a type two as well and relate 100% to how dressing your truth impacted your life. It’s had the same impact on me too. It’s funny, I have had periods in my life where I dressed more true to my nature than others. The most type 2 feature I had before was my hair. I wore it long and flowing with a side fringe. I had really hated shopping the last few years as I was trying to save money so really just buying what was cheap. But like you since knowing my type shopping has become a joy. 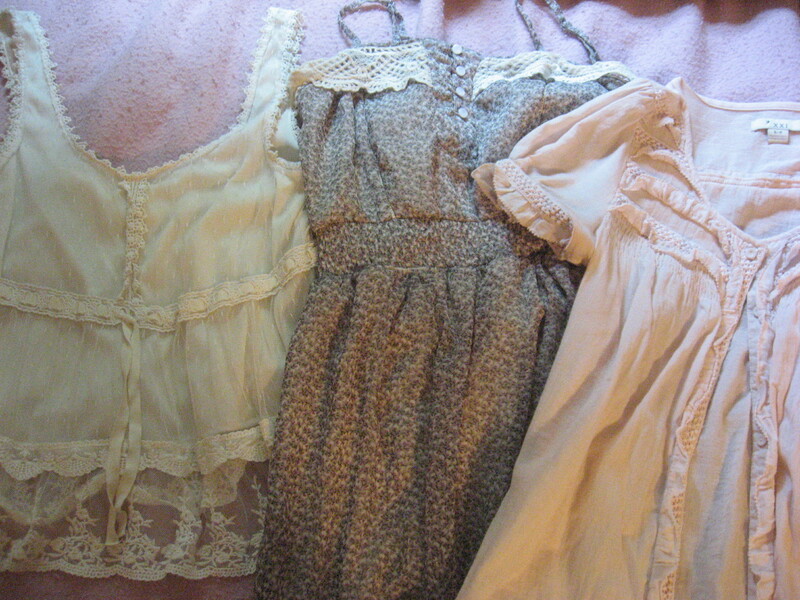 I have also re-discovered thrift stores and get pretty much all my stuff from there so as not to break the bank. I did get a few things from the dyt store, just to get an idea of what I should be going for. Life is a million times better know I know my type. As you say it’s so not just about the clothes, event bough that is a huge source of joy to me now. I love that it has helped me get to know and accept myself for who I am. I can relax and be comfortable with the fact that I am who I am. It’s given me permission to be myself with no guilt :). Another huge bonus has been learning my hisband’s type (4). It has helped us soooo much. Yes, the permission to just be myself is wonderful 🙂 I love being able to understand myself better and to have a better understanding of the people around me too. It was so fun to find your website! After doing the DYT free course last year, I left feeling pretty sure I was a type 2 with a secondary type 4 but also afraid that I wasn’t getting it quite right. But stumbling on your page, you might just be my twin! I know that sounds strange, but we share a lot of the same interests and even look a bit similar. So thanks for giving me the confidence to continue to follow my true nature. I think you look so much better on the before picture and the colours of your before clothes is so much more your colours, because you have a warm tone. I have been to dressing your truth but it is only 25 % true, which means that 25 % of the people who dress it will be perfect, the other 75 % will be wrong. I have worked with colours and seasons for many years and there is some “truth” in dressing your truth because it takes in more elements than only colour, but it is far from complete. I think DYT has put it in such an all or nothing kind of way that people sort of sell themselfes into it, and that is what you have to do when something is not complete. But what we have to ask ourselfes is; Do I feel great in these clothes, these colours, do I get compliments, do I feel more at home in my life, is it really, really true and not just something my mind made up to justify this. You are a pretty girl and you should wear what makes you look good.That orange necklace actually fits you perfect! But I know what DYT does. They say to people; You were wrong and now you are right. Lighting in photos and on computer screens can be pretty deceptive at times. Even if my coloring looks warm to you, when I’m outside in natural light, I’m definitely more on the neutral/cool side rather than warm. And, regardless of my coloring, I feel much better and more like myself when I am wearing clothing that fits my Type 2 nature. I’m sorry you’ve found the Dressing Your Truth experience to be an incomplete one. It’s been an incredibly helpful and enjoyable experience for me, and I stand behind it 100 percent. 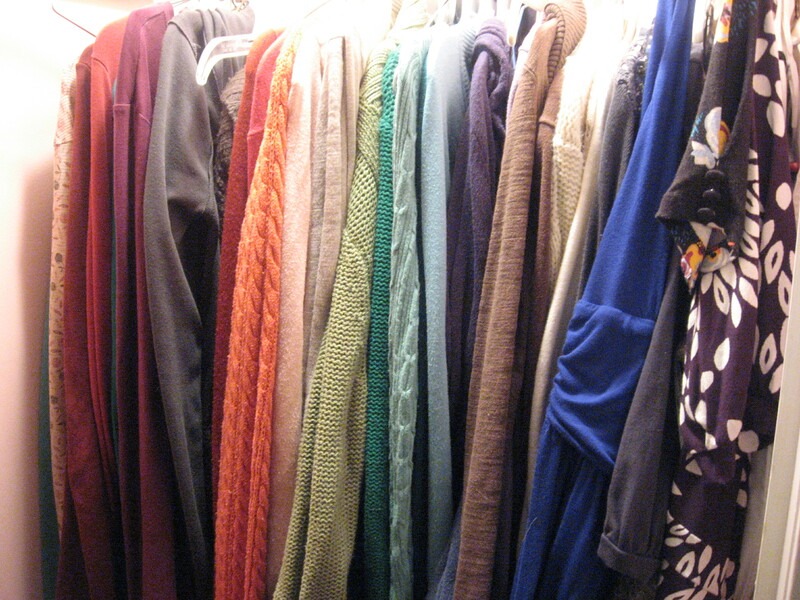 I like and refer to BOTH the seasonal color system AND the dressing your truth system. I am a “type 2”, but my hair is reddish brown, eyes are soft teal, skin is warmer. I often refer to what is the “Soft Autumn” palette, which is still soft, but more complementary towards my coloring than the recommended tones of the type 2 in the dressing your truth program. I see this coloring problem with the type 4s a lot — many of them would do better following “deep winter” or even “clear spring” palettes than the super striking bolds DYT recommends. That being said, the structure and symmetry recommended by DYT for that type do seem to make those types really pop and look stunning. So — taking some color advice from the Color Me Beautiful system(and other coloring systems), combined with the movement recommendations from DYT regarding line and styling works for me. That’s good advice, Cat. The color system in Dressing Your Truth is designed around the idea of using the broad categories of tints, tones, shades, or true hues, so there’s really a lot of variety possible within the color chromas. For Type 2s, the tones can be any colors that have the effect of being grayed down with a muted, soft effect. The color cards are really just a starting point to give a guideline, and everyone can use their own intuition to decide which versions of tones look the best for them. I have to agree. I am a Type 2 that looks better with just a tad more lightness in the color chroma. I’m a light summer or a DYT secondary 1. I think most of the color’s DYT’s Ann wears are from a soft summer pallet. I think both systems of color and energy movement work together. I sort of agree with the partial truth part of dyt. I feel that I am a 3/2 and so my style reflects this as well. I feel too harsh in total type 3 outfits and too girlie in total type 2 outfits. I seem to be most comfortable in between. I have wondered if anyone else feels this way? Yes, I feel the same way! DYT has been frustrating for me due to this. I really enjoyed this post. I am also a type 2 with a type 4 as my secondary. I could relate to a lot of what you wrote – I also have naturally started to navigate towards colors that suit me, but I have a way to go still. Seeing the transformation in your closet made me really happy! 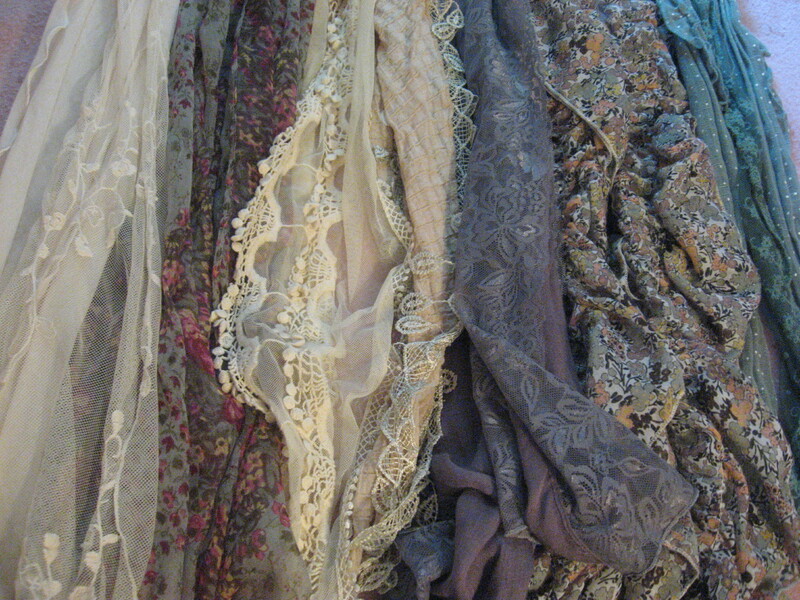 I want to someday have a wardrobe that coordinated and beautiful. Thanks for sharing your experience. Hi Kelsey, I’m glad to meet another fellow Type 2/4! I wish you the best as you continue to transform your wardrobe into one that suits your true nature! I actually watched Carols face profiling video now and it was interesting! But you look like a 4, very symmetrical eyebrows and a bit squared face, nothing is going downward like type 2s faces…anyway, you should have felt that by now since people who are not type 2 and dress that way is said to become very tired wearing the colours and clothes of a type 2! I really wish you all the luck and I am glad you are happy and wish to find my type aswell and become happy for my wardrobe. You’re right – I do have some of the Type 4 symmetry and shapes in my facial features. I do have some of the Type 2 S-curves and downward movement as well and I also have the lower contrast in eye, hair, and skin color that is typical of 2s (which is easier to see when I’m not wearing makeup.) I’ve found actually, that I would feel much more tired if I were to try wearing Type 4 clothes (or clothes of any other type) since they seem very harsh to me now that I’m used to the softer and more muted colors. I wish you the best as you figure out your type and hope you’re able to build a wardrobe that brings you joy! I get what you meant when you said you now have a relaxing wardrobe. Me too. Isn’t it a nice feeling, Gaye? 🙂 I love it. Hi! It’s nice to meet another Type 2 Secondary 4 🙂 And thank you! I know what you mean about needing some color. I think it’s probably the Secondary 4 that makes us want a little bit more contrast and boldness than other Type 2s would want. My style is still evolving as well as I continue to learn more about my Type and build a wardrobe that I love. I also think you are a type four. Hi there. I just am starting this process. I am definitely a strong 2 with a 4 secondary. I was bummed at first because I am not into scarves and boho chic and the Berkeley hippy vibe. I like a bit of structure. I am drawn to designers like Donna Karen and Calvin Klein. Clean lines and soft fabrics. I am a hairdresser and it is killing me to give up my black but I am all about the grey. Funny I was shifting my wardrobe to these colors before discovering DYT. My question is this. If you are 4 secondary can you still where black shoes. Or where does the 4 colors come into play? In your accessories? It’s actually really common for Type 2s with a Secondary 4 to like a little more structure, and you don’t absolutely have to love scarves and really flowy clothes to be a 2/4 🙂 I happen to like scarves, but I know a lot of 2/4s that don’t really like them very much. And I find that if I have on a scarf or a flowier top, than I have to pair it with something really structured like a pencil skirt or skinny jeans. As for the black shoes . . . technically you’re supposed to always stick with the Type 2 colors and incorporate some of the secondary 4 styles and design lines rather than using the Type 4 colors. A good compromise would be to wear a very dark charcoal gray or a black that seems kind of muted and soft rather than a really stark black. I still wear black shoes once in awhile because I haven’t found a good gray replacement yet, and because they are so far away from my face that it’s not like wearing a solid black shirt or something like that. It’s good to meet another type 2/4! I took the free online course two weeks ago, and really enjoyed it. Like you, I realised that I’ve been drawn to type 2 elements for most of my life (romantic, flowing style; ruffles & frills). I’m looking forward to taking the whole course someday. How have you been able to incorporate your secondary type into your dressing? For me, I’ve done it through colour (e.g. soft type 2 styles, but jewel-toned colours). I’m glad to meet you! The way I’ve been incorporating my secondary 4 has been mostly through style. I find that I like my clothes and accessories to be a little more on the simple side, and I also like to have a little bit more structure. Like if I’m wearing a flowy top or a scarf, I like to pair it with skinny jeans or a pencil skirt to give more of a balance. I also like to have a little more contrast between darker and lighter tones in the colors that I wear. Hello, I just want to say that I take issue with those who are telling you what type you are. Carol Tuttle emphasizes that we are the expert on what works for us and we are not supposed to let others tell us who we are or ask others what type we are. She also emphasizes that types are not just about facial lines, but more of an energy and a movement. You FEEL at home and like yourself in T2 colors and styles, then you are a T2. Those who are deconstructing your type are probably fixating on one thing and cannot possibly know what kind of energy you give off or what kind of movement is yours. You look great! If I were to break it down just by some facial lines, I see downward movement a softened nose bridge and I see S-curves. No one is a perfect example of any type because we are a mixture of the 4. It is up to us to determine what is predominant in us. As for the person who says you look warm per seasonal color analysis. I disagree. You had a tan in one picture and wore warm colors, which skews results. You are quite right when you say you are neutral to cool, I am sure. Keep up the good work and enjoy your evolving style. By the way, I am also a T2 and I think I may have a secondary 4. If I go by color analysis, I am a soft summer deep (4×4 – 16 seasonal types), which would be a T2/T3 with a smattering of depth from winter. I can tell you, no matter what my color or face or any other part of me would tell you, I have very little T3 in me. So, seasonal color analysis does not always equate to DYT. I am undecided about which way to go because of the conflict between the two. I always felt I could use a little more fire in my personality, but it is not who I am. The only time that fire emerges in me is when I feel compelled to stand up for someone else. Like now. My response to someone speaking to me like they did to you, would be very diplomatic just like you were. Well said. I agree with your gentle reminder that strength can present in a myriad of ways. At the tender age of 61 I have just done my profile…Oh– I feel like I am, at last, home. You are so much a T2…I realise that I often chose clothes that were “expected” of me.I think my mother may well be a T3…very dominating and overpowering !. I took up bellydance in my early 40’s..because I loved the excuse to “play dress ups” and wear beautiful, soft, flowing clothes..as an only girl, with a difficult childhood I NEVER was able to play dress ups.. I had my colour chart done by “Color 1 Associates” back in the early 80’s and find that T2 is very close.I am So glad I found you. You have given me the desire to continue. oh sorry for the novel.. Bless-ed Be. 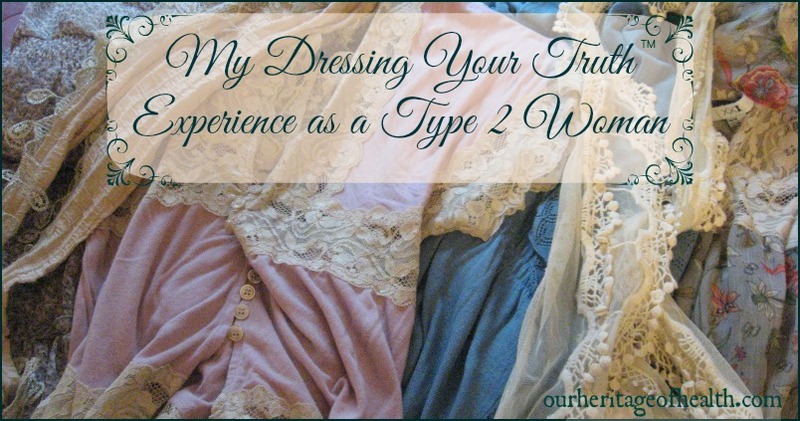 I found Dressing Your Truth recently and I’m also a Type 2. What are your favorite stores to find Type 2 clothes? It depends on the season (sometimes I’ll find lots of good Type 2 colors one year, and then the next year won’t find as many), but in general I’ve found most of my Type 2 clothes at Kohls and Forever 21. (You have to search a little harder in Forever 21 since they have a lot of things that aren’t Type 2, but I’ve found some gorgeous Type 2 colors there.) I’ve also found a few things at Target and JC Penney. Hi! I stumbled across your post in a Pinterest search I’ve been following DYT for about 2 years now, and am also a 2/4. I think it’s so interesting that while my coloring is different than yours (red-brown-blonde with hazel eyes), we share a lot of features. And I played dress up much like you describe I love DYT! I think that’s really interesting, too, that coloring can be so different but people can still be the same types. It’s one of the many things that makes DYT so fascinating! I feel I am a type 2 by my personality traits but have the facial features of a type 4. My body shape is athletic in built. So I am clueless about this system. In general, facial features and body language are considered to be more reliable ways of typing yourself than personality because personality can be more easily influenced. A couple of things to think about would be 1) Which Type do you feel you were more like when you were a child? 2) Which Type does your beauty sixth sense lean toward? Have you always loved clothing and accessories that are soft and flowing or ones that are more bold and structured? Asking yourself those sorts of questions might help to make it more clear. How did I stumble into THIS section?! After buzzing through it I’m convinced that you and all these other women are guilty of over-analyzing things…or maybe it’s just a male thing. Wear what you like…if someone doesn’t like it, you all merely have a difference of opinion, that’s all. Or maybe that’s just my male arrogance coming through. Thank you very much, Lorie, for taking the time to answer 🙂 I’m really glad you did, because I can relate to your experience. I’ve been struggling with anxiety for three years aprox. and it can get on the way of “seeing clearly” who you are (sometimes I think I’ve been profiling my anxiety and not me… does this make sense?). I’ve been also making a mistake that (I think) is very common in the type 2 world: considering myself through the eyes of others, and defining myself using what people in my life had said about me. And maybe my s4 was trying to find a coherence that, simply, isn’t there: because what do people know about me anyway? The way that I’ve been acting around them? I’ve been called so many things, I was bullied at school for being a nerd (today it is a cool trend… ) and also shamed during my teen years for not having friends and being somewhat strange for my age. I just want to thank you one more time, Lorie and all the other commenters, for sharing your stories and help me share mine. Love. You’re very welcome 🙂 What you said about profiling your anxiety and defining yourself by what other people have said about you in the past makes a lot of sense. I remember Carol Tuttle saying before that it’s actually quite common for people to do that (and I’m sure it’s probably even more likely for us 2/4s to do that because we tend to go deep with things and internalize them.) I’ve heard several other people with the 2/4 combination say that they had been living more like a T4 for much of their life and that it was challenging to let themselves live like a T2 again but that it was also very freeing to let the T4 rest and live true to their T2 nature. Your comment isn’t too long at all, and this is a perfect place to discuss this because there are so many of us 2/4s here 🙂 I wish you all the best as you continue with your DYT journey! Ahhhhh. That’s how I feel right now. I have struggled to be so many things in the past few years-especially as a mother. I’ve read so many books and blogs that tell me how I should Do this or do that. And I became anxious and fierce and that’s not the real me. So often I’d end up tucked away somewhere just to cry and cry bc I couldn’t live up to this super woman ideal that I see around the internet. But. I am definitely a type 2. The facial lines, the movement, the frills and lace, the lack of punctuality, the questioning (especially second guessing myself), the doodles, my earrings are 99% of the time teardrops, the extreme dislike of loud, wanting to be comfortable and feminine, feeling easily overwhelmed. I just feel this complete sense of tranquility knowing that I’m ok just being who I naturally am. It even shows in my relationships. I am more relaxed and others are more respectful of me. I especially have trouble with my type 3 almost teenage daughter. We have always clashed! But now that I know this, I am able to be more patient with her. And as I’m living more in line with my type 2 self, she is more respectful towards me. I think others take you more seriously when you are true to yourself. At least that is my experience. So it’s really more about Living Your Truth than just Dressing Your Truth. (On a side note, my favorite pants this summer have been type1 pink capris, but they go so well with all my type 2 flowy, frilly tops! And I feel happy in my clothes. So I think it may be ok to mix and match a bit. I’m probably a secondary type 1as I relate to that type a little, but overwhelmingly I’m a type 2). I’ve read all your posts and replies in this series and thank you for sharing. 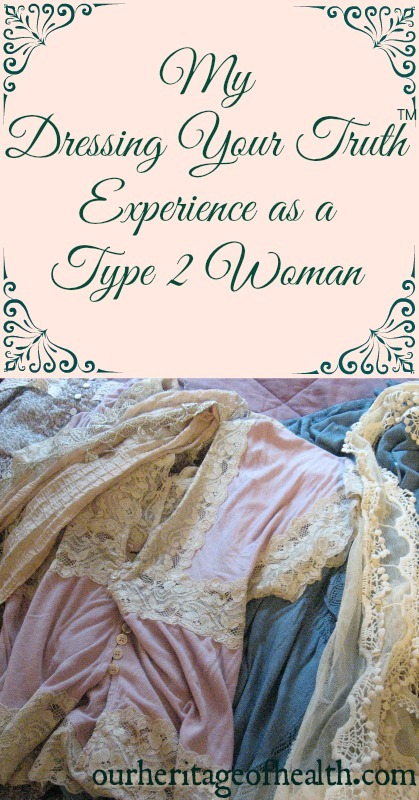 I’d like to find more blogs by type 2 women living their type. I feel I’ve been influenced so much by what I’ve read in the past 20 years that pulled me away from my natural self. So thank you again! Sorry this is so long!! I even tried not to write every little thing I wanted! I hear you about the not wanting too loud & can get overwhelmed … relate to much you say. I, however have lived my life in a male dominated industry so I have developed a style that is NOT lacy or frilly .. I like elegant, clean lines .. more simplistic designs – however I DO like to have a cool scarf or other jewelry .. the details are everything … Live your Truth is the main thing .. the dressing cones pretty naturally after that I find . This could be a game changer !! Oh yes, comfort is SO important!!! Even if I absolutely love the way something looks, if it doesn’t feel comfortable when I’m wearing it, it usually ends up just sitting in the back of my closet. That’s really exciting that your husband watched the profiling course, too, and is going to watch the 2/3 relationship video! It’s so nice to be able to have that insight and understanding of each other! I just discovered DYT. I am not sure what Type I am yet. I do know I’m not a 3 or 4. Everything about Type 2 is soothing to me but my facial features may be more T1. I am enjoying all of the posts from others, very insightful for me. I like the suggestion to think about who you were as a child. I look forward to reading more from your site. Have you had your type verified with an expert? Cause I’m with the crowd who also thinks you must be 4/2 (with what is clearly an overdeveloped 2), with those high cheek bones. I think posts like yours are what make DYT so confusing for people who are struggling to type themselves. Unless you’ve verified, it’s kind of unproductive to go public with your conclusion, especially in the comments where there is so much confusion and stubbornness. The way you handle responding to people screams type 4. Just trying to help since who knows how many people you’ve confused by now. No, I’ve never had my type verified before. By the time I heard about DYT, Carol was phasing out the option for the personal “confirm your type” sessions with her, and I haven’t been a guest for any of the more recent Fb live events she’s done. It seems, though, that one of her biggest points of emphasis lately has been on empowering women to be their own experts about which Type they are and that many of the resources that she has been providing have been geared toward making Type confirmation by an expert something that isn’t necessary for women to feel confident in their choice of Type. I agree with you that I have high cheekbones, but I put much more weight on how I feel when living and dressing as a Type 2 than I do on one individual facial feature. I’m a bit confused by why you think the way I handle responding to people screams Type 4, especially since most of the Type 4s I know are much more abrupt and concise in their replies. The confusion you mentioned, though, is the reason why Carol has always said that it’s best not to try to tell someone else what their Type is because it’s such an individual process and each woman knows best for herself which Type she is. I recently started following Carol’s system and believe I’m also a 2 with a well developed secondary 4 but those 2 types seemed so at odds (caring vs. abrupt, flowing vs. structured, diplomatic vs. opinionated) that I’ve been struggling to accept that – and of course over analyzing! It’s awesome to find other women who are the same type. I work with and was raised by an engineer and I think the analytical side of my mind thrives in that arena, but I also have a soft, creative side that I’ve suppressed for a number of reasons during different times in my life. The bottom line, though, is that I’m happier when I have a balance of the two types in my life, with more emphasis on the Type 2 way of living. I really resonated with your statement that you feel more tired when you dress as a T4. I find it can be exhilarating and exciting, but in the end I need to recharge with soft, comfortable, muted clothing. I also like to balance the softness with some structure, contrast, simple lines. It all makes sense now – thanks! I know what you mean about Types 2 and 4 seeming at odds with one another sometimes! Their both lower movement types, so in that way they feel similar, but “soft and subtle” and “bold and striking” definitely feel like opposites! And if you’ve been in a very analytical environment for a long time, it would make a lot of sense that your mind would thrive in that way. I completely agree with what you said, though, about feeling happier with a balance between the two types with more of an emphasis on Type 2. I used to try too hard to live more like a Type 4 and it felt unbalanced for me, but settling into Type 2 as the main emphasis with Type 4 being a supporting role just feels right. And finding a similar balance in clothing helps with that, too, I think and makes everything feel more balanced. On February 4, 2018 I rediscovered myself watching Carol Tuttle’s videos. I am a type 2/1. At 63 it’s exciting to realize that there wasn’t anything wrong with me all these years. No wonder I never liked trying to be aggressive or confrontation. For so many years I kept thinking if only I could live in a more quiet and gentle place. My mother died in 2014 and since then I’ve been trying to find the real me again. Over the last 1 1/2 years I’ve been moving away from the chic all black look. I also realize that color is only part of it. It’s my energy that is most important. I really do fill at home beginning to wear softer colors. Even some muted florals that I hated before. Think that was because my mother didn’t like my soft, gentle nature. She wanted me to be very talkative,outgoing and aggressive. I’m so glad I found DYT and your site. That’s exciting to hear that you have rediscovered yourself and that you now know about your Type 2/1 nature! I agree with you that it’s such a good feeling to know that the things we thought were “wrong” about us really aren’t wrong at all. I’m sorry to hear about you mother, and I’m glad that you are discovering the real you and starting to feel more at home now in the Type 2 styles, and most importantly, the energy. I wish you all the best as you continue with this process and journey! I am a child of the 80’s. Graphic prints. Black and white. Hot vivid fuchsia and turquoise colors. I also like frills (left over from early Diana days). I seemingly am a Type 2. I will slowly try to weed out my wardrobe for softer colors – however – do you think they are appropriate for business attire? I already have embraced grays. Only wear silver jewelry (very minimal). Trying to figure out how the Type 2 can have a working closet – not just for personal time, but also work. Help! Also – besides thrift shops – any stores help Type 2’s out in your opinion. Type 2s can find a balance between soft and comfortable and structured and polished. I don’t usually need to wear business attire very often, but when I do want to look more professional, I choose clothes that have a softened structure to them, and I usually tend to have at least one item of clothing that leans toward the darker end of the Type 2 colors. And, like you mentioned, I usually go a bit more simple and minimal with the jewelry and accessories, too. As far as stores that are good for Type 2s, it’s a bit hit or miss. I haven’t found any store that I would call “Type 2 stores,” but I’ve been able to find several good Type 2 items at stores like Kohls, Target, and JCPenney, and I’ve heard other Type 2s say that they’ve found good things at Maurice’s, although that’s one I’ve never shopped at personally since there aren’t any near where I live. Oh my… I can’t understand all those negative and invasive comments that question your type, Lori. It’s something that has a great effect on me: all those bullies telling other people (anonimously!) how “wrong” they are even without anybody asking for their feedback or opinions. I felt the need to say something and to show you support: of course YOU know who you are! Not some arrogant, emotional unstable and vulgar troll from the internet. Keep up the good work, fellow 2/4! Much love! Thank you so much for your support, and I really appreciate your taking the time to let me know that! You’re absolutely right that I know myself better than someone on the internet who has never even met me in person before. It’s so nice to know that there are still kind and considerate people like you on the internet amidst all of the trolls. Much love to you too!